One of the most beautiful aspects of traditional Chinese medicine is as a tool to live harmoniously with the seasons. At this time we harvest the bounty that grew during the summer so we can prepare for the cold winter ahead. Squashes and pumpkins become plentiful and are very nourishing especially as warm soups. Adding pungent spices such as turmeric (avoid in pregnancy!) or cumin will help warm and nourish during this season. 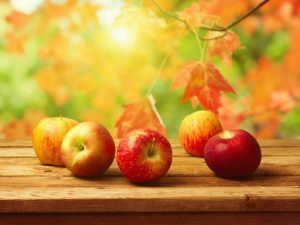 Preserving extra fruits and vegetables, gathering wood for fuel, and retrieving warm clothing from storage for the cold, darker months, are important in autumn. It is a time to organize and finish projects that you began in spring and summer and prepare for winter – the season of rest and quiet. In Chinese medicine, autumn relates to the emotion of grief and the need to “let go”. This can be an overwhelming and difficult change and we frequently get people coming in for acupuncture to help with this transition. Autumn is associated with the energy of the Lungs in Chinese medicine. Get outside and enjoy the beauty of the change of the season. There is no better way to nourish your Lung energy than by taking deep breaths of fresh air!